Louis Zamperini had quite the life. And no, not really one that I am jealous of. Zamperini was a famous Olympic runner who was drafted to fight during World War II. During his deployment he survived a plane crash, only to be stranded in the Pacific Ocean for 47 days. But wait, it did not stop there. He is found by the Japanese and taken to a POW camp. His story is shared in the film, Unbroken, out in theaters now. Unbroken has a lot to live up too. The film is based on the 2010 best-selling novel written by Laura Hillenbrand. The Academy Award winning Coen brothers took on the task of adapting the novel for the screen. On top of all of that, Angelina Jolie directed the film. So much for no pressure, right!? One of the smaller names attached to this big picture is Jack O’Connell. O’Connell is a relativity new actor from England. His other notable roles include 300: Ride of an Empire and the British TV drama, Skins. His performance in Unbroken is his biggest yet. Unbroken throws the audience right into the action. In the first scene, we join Zamperini and his flight crew in the middle of a shoot off with the Japanese. Jolie then takes the action down a notch showcasing Zamperini as a troubled teenager. His family just immigrated from Italy to the states and Zamperini had not been able to find his place among the crowd. With the help of his brother, he tried out for the track team, ultimately securing a plan for his future. Zamperini worked very hard for the next few years and earned himself a spot on the 1936 US Olympic track team in Berlin, Germany. The film alternates between Zamperini’s Olympic career and the beginnings of World War II. Finally we catch up to Zamperini and his flight crew in the middle of another shoot off. This time the results are not in his favor. Zamperini’s plane crashes into the Pacific Ocean. He survives, along with two other crew members only to be stuck at sea for 47 days. The grueling 47 days at sea would have been enough, but unfortunately his journey does not end there. The rescue came with good news and bad news. The good news was Zamperini’s days at sea were over. The bad news was he was picked up by the Japanese and thrown into a POW camp for the remainder of the war. During his time in the POW camp, Zamperini became the main target. “The Bird” (played by Japanese actor Miyavi) took a special interest in Zamperini and continued to torture him over and over again. 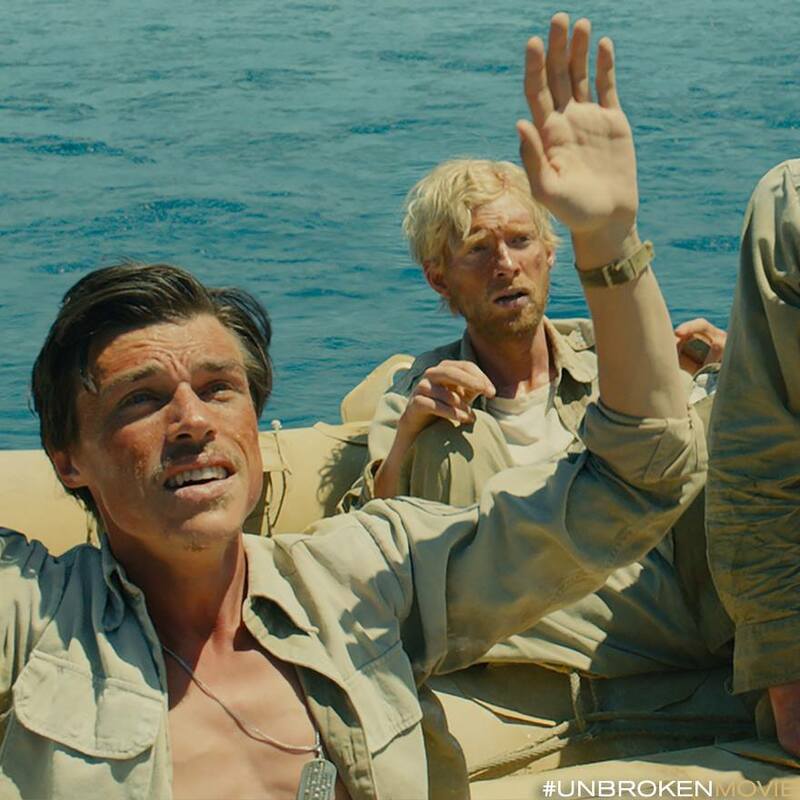 Zamperini was able to power through all of the hardships and survives to the end of the war. He is able to reunite with his family and persevere after his unbelievable journey. Unbroken has all of the ingredients for an award-winning film. The Coen brothers were able to take the story and adapt it for the screen. Semi-new director, Jolie, was able to tell the story as a whole, engaging the audience to properly share Zamperini’s story. Jack O’Connell and Miyavi shine as a team, both giving strong and memorable performances. What is puzzling then is Unbroken was left off the short list for major nominations at the SAG and Golden Globe Awards. Maybe Jolie played it a bit safe when it came to filming. She allowed for a strong story to be displayed on-screen, but still missed the intense and raw quality that most WWII films have. The depth and range of films this season is not helping either. I have yet to see some of the major films nominated, but next to Whiplash, The Theory of Everything, and Boyhood, it is just left in the dust. In another year it might have had less competition. I was surprised to see that O’Connell was left off the short list for lead actor as well. I thought his performance was strong very passionate. According to BuzzFeed News, O’Connell was very dedicated in order to landing the part of Zamperini. “The piece alone, I obviously felt compelled to chase it down…The whole thing seemed enormous anyway from the beginning. I knew it was a different caliber of possibility than the ones that I’d been offered before.” O’Connell told BuzzFeed. In order to really nail the part, O’Connell worked with a dialect coach to nail the true American accent. He also lost 30 pounds for the role. He told BuzzFeed News that the weakness from the weight loss helped him get into character. “The weakness definitely helped with the performance. It was an instant key in, an instant insight into the hunger that these boys were dealing with,” said O’Connell. Unbroken was a strong film overall, just not strong enough this years award circuit. I would love to see O’Connell’s name come around on Oscar nomination day, Jolie’s also. However, the odds right now seem very doubtful.